FALL 2019 DATES NOW UP! The journey from yoga student to yoga teacher is a profound experience and an intense commitment to your own growth first and foremost. Whether you want to just dive deeper into your knowledge of yoga asanas and philosophy, or your dream is to lead and inspire others, this is the training for you. Yoga Strong's 200-Hour Power Vinyasa Teacher Training will give you the knowledge and tools to inspire your future students with the same passion for yoga that brought you to this point on your journey. The strength of this program comes from the intense focus given to the form and fundamentals, action and alignment as well as lots of practice teaching, self study, and a heavy focus on hands on assisting. Amanda Fulmer is an experienced leader and trainer of teachers. She has combined her more traditional trainings through the Sivananda lineage with her power yoga trainings through Baptiste Yoga. Her advanced studies (500 YTT) with Circle Yoga Shala gave her new perspectives on ayurveda and yoga as therapy which also enhances the way she teaches teachers. Her main goal is for each and every student to come out of training being confident and fully able to teach a safe and balanced yoga class. Mostly because she wants to take great yoga classe sin her community! Beyond that she hopes to open up, and wake up, her students to what they may have been sleeping through (not intentionally) in their lives and create a sense of togetherness and community through this thing we love called yoga. Yoga Strong is a 200 hour Registered Yoga Alliance School. On top of hours in training you will have homework and be required to take yoga classes on your own. Hope to read your application soon! Our 8 month program runs from September to April every year. Dates vary between location so please look only at the location you will be attending training. The course will consist of:- personal and group practice (meditation, pranayama and asana), learning to design and teach a vinyasa yoga class, learning basic anatomy and physiology, a thorough breakdown of alignment, modifications and benefits of the postures, learning how to assist, evaluate bodies physically, emotionally and prevent injuries, Pranayama breathing techniques, yoga’s roots and history, the lifestyles and ethics for yoga teachers, effective presentation and communication skills to teach to different levels and honestly so much more. This year our Canton trainees will meet the first Friday (5:30-9:30pm) and Saturday (9am-6:00pm) of every month, and then every other Tuesday evening 5:30-9:30pm. *there are slight differences around holidays. Please check all dates carefully. Cleveland trainees will meet the 3rd weekend of every month Friday, Saturday and Sunday. Fridays 5:30-9:30pm, Saturdays 9:30am-6pm and Sundays 12:30pm-8pm. *There are slight exceptions around holidays. Please checka ll dates carefully. We strongly encourage 100% attendance in the course. If a student must miss, only 8 hours can be missed without required make up time. If you miss more than 8 hours you risk not receiving a certification at the end of the course. Absences must be approved by the lead trainer and must be rescheduled by the lead trainer. If you have to make up extra hours during separate meeting times with the teacher, you will be billed $50 per make up hour. Each student will be required to take 4 classes a month outside of training. 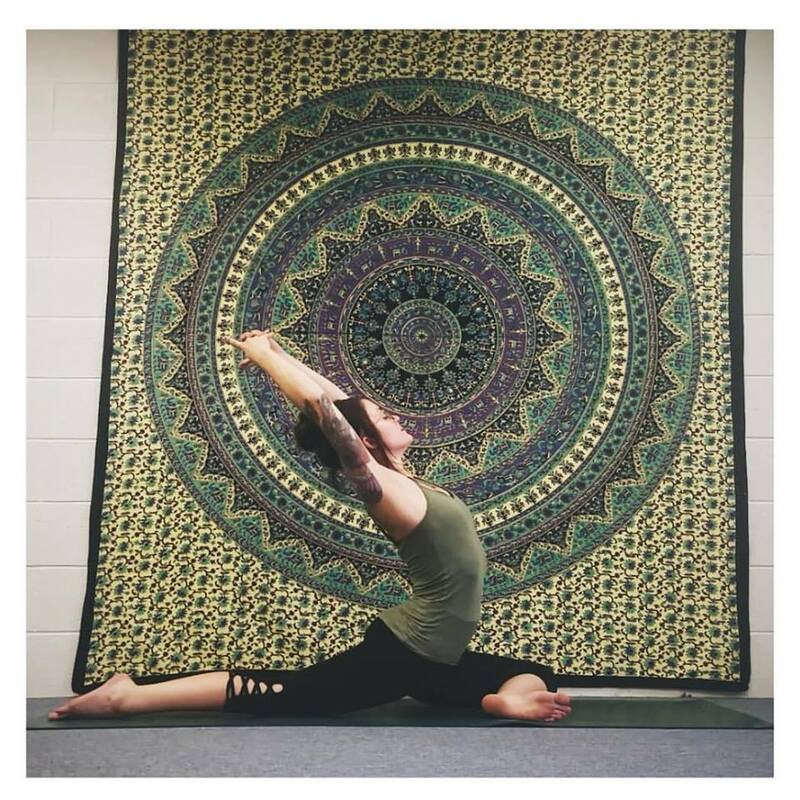 Your lead trainer will be Amanda Fulmer, E-RYT 500 (200 hour Hatha certificate, 200 Hour Power certificate, 300 hour Advanced teacher training Circle Yoga Shala), Aerial Yoga Certified, Barre Certified Instructor and creator of the syllabus and training program at Yoga Strong. *required reading material is not included in cost of course. *Payment plans can be discussed and there are zero refunds for teacher training once the program has begun. if yes please explain in lower section comments. We will be running 2 consecutive trainings, Canton group will meet at Canton studio first weekend of every month. Cleveland group will meet at the Cleveland studio on the second weekend of every month.